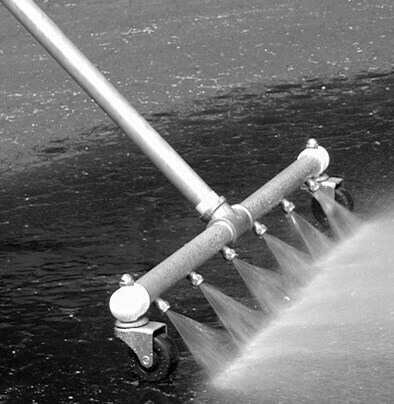 The latest and most effective high-speed water brooms surface cleaners are easy to use, resulting in less strain and fatigue to the operator. The benefits of using these products are clear, more work can be done in less time, requiring less labor, less fuel and less water consumption--all of which means greater savings in time, stress and money. All these benefits add up to a more cost-effective piece of equipment for any user who routinely clean large, flat surfaces, roof tops, decks concrete floors, parking lots, warehouses, boat ramps, garage floors,and curbs. 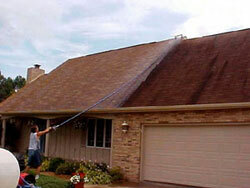 The following comparison chart shows the time taken to clean a typical size driveway (400 sq. ft.) using three different components. High Pressure Surface Cleaner - SAVE Time & Your Back! 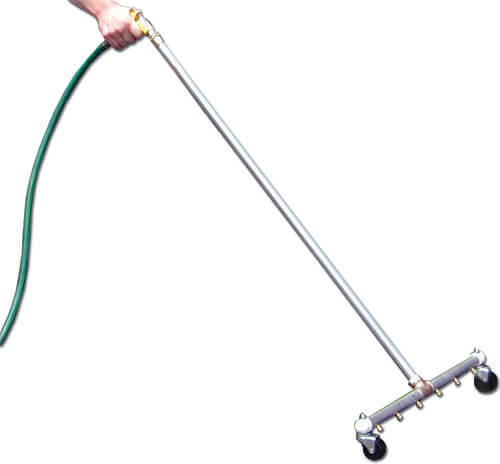 High pressure concrete surface cleaners or water brooms are powerful, reliable and universal in pressure washing driveways, boat decks, flat surfaces and more. Used to clean flat surfaces quickly, easily and evenly. Used to clean surfaces quickly, easily and evenly. This unit serves great for cleaning and rinsing any flat surface. This 16" broom surface cleaner offers shorter cleaning times, energy savings, and easy operability. 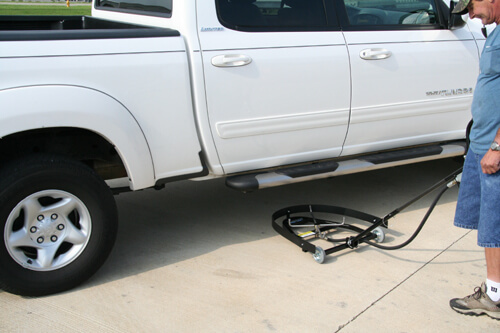 The ideal tool for larger surface areas from parking lots, driveways, and sidewalks to remove gravel and debris. Water flow is directed forward through jets as you walk. Gravel and trash are pushed ahead. Manufactured with specially extruded, high temper aluminium pipe. Pistol grip valve for flow control. Available in various large spray widths. Protective end caps provided at both ends of attachment. Use for applications such as tennis courts, restaurant drive thru areas, bank drive up lanes for quick and easy clean ups without heavy equipment. 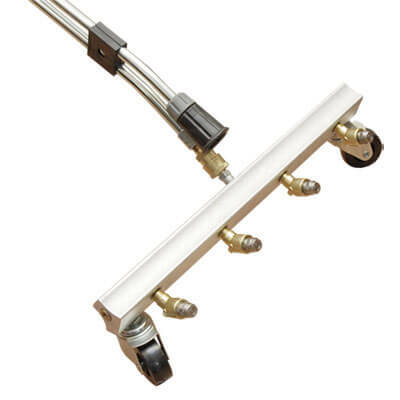 Designed only for garden hose feed supply of 60-75 PSI. (Garden Hose not included) If you are thinking green, this water broom uses a third less water and is three times faster than a standard sprayer. It is also built to last, featuring corrosion resistant brass fittings, aluminium piping, and rust proof casters, all of which are recyclable. *We have found the average city water pressure to be 60 lbs/PSI. *A standard 3/4" garden hose alone uses an average of 9.5 GPM. A must have to maintain a clean & well cared vehicle. 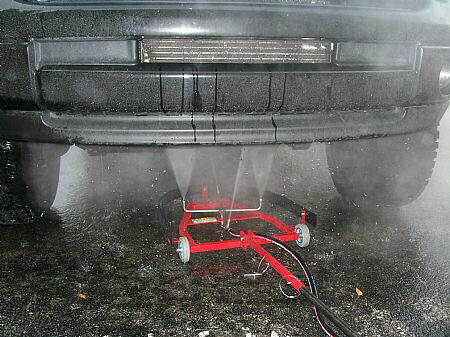 This undercarriage cleaner makes it easy to clean the underside of vehicles. It can be used to clean cars, trucks and more. Agricultural and Construction Machinery can be cleaned on site without the use of a car lift. 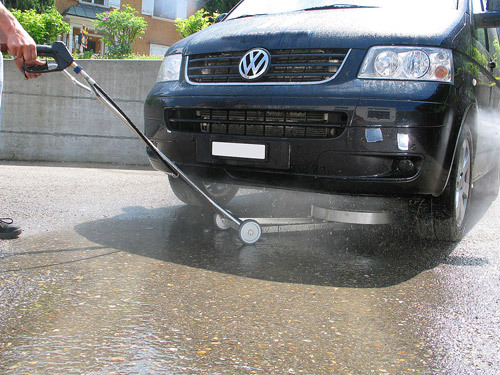 The undercarriage cleaner is time saving and cost effective. Can be used with hot or cold water. All stainless steel construction! With 4000 PSI trigger gun and 4 cleaning nozzles, the operating pressure is up to 4000 PSI. It can withstand temperature up to 250 degree fahrenheit and utilizing almost any type of liquid chemical or acid solution. Minumum Clearance Height Requirement: 5.5"
Sturdy construction with 14-gauge painted steel frame with aluminium handle socket. 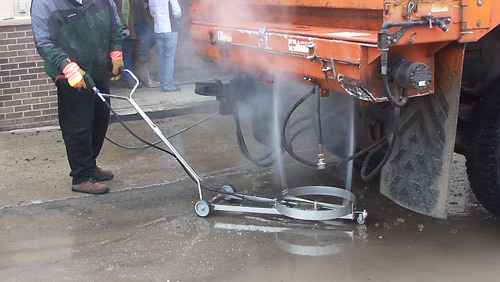 For use in moving large volumes of water, mud, debris, waste, scraps, slush or snow and flood clean-up. Great for construction sites, plants, factories, large commercial areas, loading docks, agricultural, food processing, arenas, outdoor areas and around large drains.